1131 - 1131 - Shipmodul MiniPlex-3USB Advance NMEA 0183 Multiplexer for only $248.95 ! Replacement for E85001 PC/SeaTalk/NMEA 0183 Interface Module - The Raymarine E85001 PC/SeaTalk/NMEA 0183 Interface Module was retired several years ago. Raymarine has not introduced a replacement for this device. The Shipmodul 1131, 1132, 1133, 1135, 1136 and 1137 have a bi-directional SeaTalk 1 interface which enables conversion between SeaTalk1 data and NMEA 0183 sentences. This conversation works both way, allowing the MiniPlex-3 units to replace Raymarine's discontinued SeaTalk - NMEA bridge E85001. The MiniPlex-3 Series has a rich set of features and configuration options, enabling the user to tackle almost any NMEA bottleneck or interface problem. 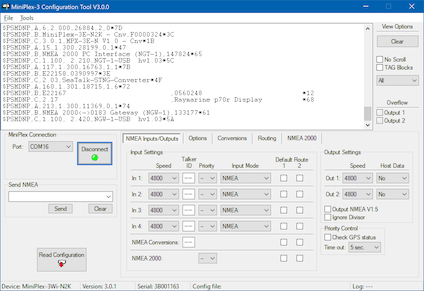 The supplied Windows utility MPX-Config3 allows full configuration of the multiplexer and monitoring of NMEA data passing through the multiplexer. When Input 1 is set to SeaTalk mode, this NMEA input becomes a bi-directional SeaTalk port, offering conversion between the most common SeaTalk datagrams on a Raymarine SeaTalk1® network and their NMEA 0183 counterparts. These sentences are combined with NMEA sentences received on the other inputs. When Priority is enabled, SeaTalk data can be assigned highest or lowest priority. Currently, only conversion from SeaTalk1 to NMEA 0183 supported. Conversion from NMEA 0183 to SeaTalk1 will be available soon through a firmware update. Gyro- and fluxgate compasses produce NMEA sentences at a high rate (10 sentences/second or more). This can lead to a buffer overflow in the multiplexer. Although this overflow is handled properly without data corruption, it will lead to a delay of NMEA sentences of up to 20 seconds in extreme situations. This produces a severe problem for autopilots, which cannot make proper course corrections when their heading feedback is delayed for 20 seconds. The Real-Time option prevents this delay by bypassing the buffer of that specific channel and forwarding the data immediately to the multiplexer's NMEA output. As a result, the heading is never delayed more than 0.2 to 0.5 seconds, depending on the amount of other NMEA sentences passing through the multiplexer. This features adds an extra $--STN sentence or a TAG block to NMEA sentences to indicate on which NMEA input a sentence is received.